POINT LOOKOUT, Mo. 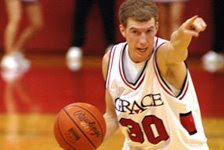 – Talking about his team’s first-round opponent in the 18th annual NAIA Division II Men’s Basketball National Tournament, Grace College coach Jim Kessler said Warner Pacific is more athletic than his Lancers. Kessler believes the Lancers, however, are a better basketball team. Warner Pacific, a school in Portland, Oregon, received an at-large bid to the 32-team, single-elimination tournament. The Knights were ranked 15th in the final NAIA poll and sport a 21-8 record. The Lancers, who advanced to the Elite Eight of the tournament last year, received an at-large bid after being ranked 20th in the final poll and take a record of 20-10 into tournament play. When the Lancers and Knights square off Thursday afternoon, it will showcase discipline and structured offense against a fast-paced, run-and-gun style of play. To read the remainder of the story, click here.